Lightweight, loose-fitting, cotton clothing is recommended and long-sleeved items should be included for protection from mosquitoes and the sun. During the rainy season an umbrella is more convenient than a rain coast. A jacket may be needed in hotels and restaurants using excessive air-conditioning. There are three important silk textiles in Cambodia. They include the ikat silks (chong kiet in Khmer), or hol, the twill-patterned silks and the weft ikat textiles. Patterns are made by tying natural and synthetic fibers on the weft threads and then it is dyed. It is repeated for different colors until the patterns firm and cloth is woven. Traditionally, five colors are used. Red, yellow, green, blue and black are the most used. The Sampot Hol is used as a lower garment and as the sampot chang kben. The Pidan Hol is used as a ceremonial hanging used for religious purposes. Sot silk weaving has been an important part of Cambodia’s cultural past. It has been documented that people from Takéo Province have woven silk since the Funan era and records, bas-relief and Zhou Daguan’s report have shown that looms were used to weave sampots since ancient times. Since ancient times, women have learned highly complex methods and intricate patterns, one of which is the hol method. It involves dying patterns on silk before weaving. What remains unique to Cambodian weavers is the uneven twill technique, the reason remains unclear why they adopted such an unusual method. The ancient bas-reliefs however provides a complete look at how fabrics were like, down to patterns and pleats. Silk woven pieces are used as heirlooms, in weddings and funerals, and as decoration in temples. The sampot is the national garment of Cambodia. The traditional dress is similar to those worn in the neighboring countries of Laos and Thailand, but variations do exist between the countries. The sampot dates back to the Funan era when a Cambodian king allegedly ordered the people of his kingdom to wear the sampot at the request of Chinese envoys. Beneath the warm Cambodian sun, a person’s productivity relies heavily upon the suitability of one’s dress. Since little is accomplished in blisteringly hot clothes, Khmer people for generations have tied kromas around their waists to work and play in cool comfort. The Khmer scarf, woven from cotton or silk, has been a fashion staple since Ancient times. While some claim the thin cloth, wrapped around one’s head or neck, is used primarily to wipe the sweat from a hot face, others say wearing a kroma is as ‘Khmer’ as wearing a necktie is American.Srey Yar Savdy, head of the Buddhist Institute’s Mores and Tradition Department in Phnom Penh said that the kroma has had a home in Cambodia since the first century reign of Preah Bath Hun Tean. 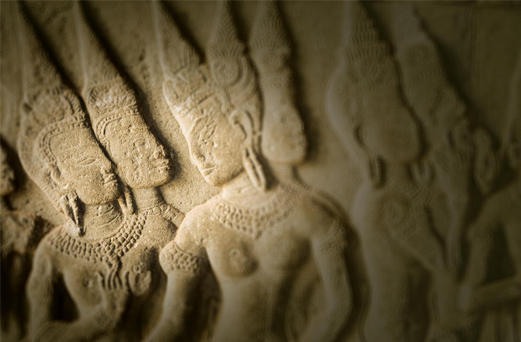 It is not clear when exactly the kroma hit the streets, but it has been a symbol of the Khmer kingdom and its people ever since. “Nowadays, people are more particular and they like to have some quality instead of the less expensive kroma they used to use,” said Channavy, the co-manager of a small weaving business. She said the demands of discerning customers have compelled her to prepare her loom with greater care in order to meticulously spin the cotton thread into a bobbin.